Med Couture	There are 2 products. SO REFINED — MINE ALL MINE! Sporty seams and a contoured back knit panel give this scrub top from Med Couture a sophisticated look worthy of its name. The Refined top is from the Activate line, featuring a four-way stretch fabric that was made with your comfort in mind, as well as six superbly place pockets. Choose from gorgeous fashion colors. The fashionable Med Tech Soft Shell Vest from Med Couture is versatile and gives your look a nice change of pace! 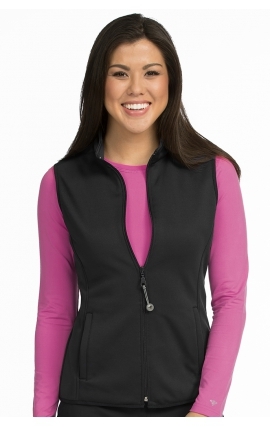 This zip-front vest is made with soft fabric that feels great to wear and makes it easy to move around. Two spacious lower pockets provide plenty of space to conveniently carry your favorite accessories and instruments. - Zip front- Two pockets- 100% polyester- Center back length: 24 1/2"